The Madden Julian Oscillation plays a key role in driving intraseasonal climate variability. A new paper reviews its impacts and argues for including it in the "climate-weather continuum" to improve both climate and weather forecasts. This map depicts the record-breaking warmth that set rivers rising and avalanches tumbling in Alaska last month. This recent video highlights WestMap, a NOAA-funded tool that provides high quality climate data for the western U.S. Take it for a spin yourself. 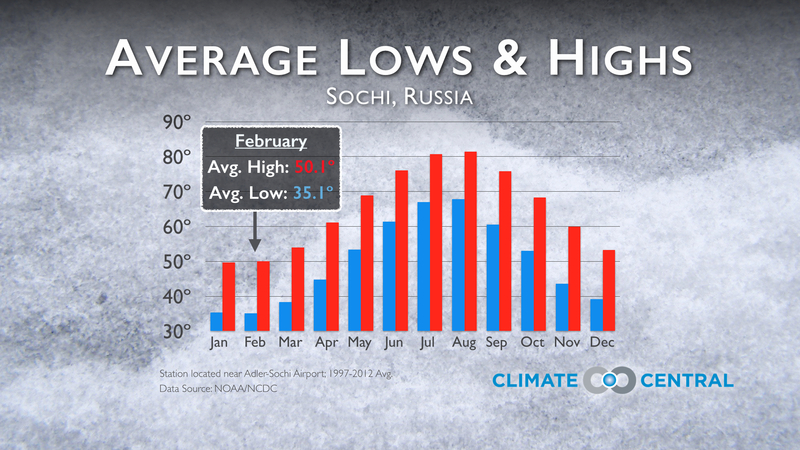 We introduce you to the climate of Sochi, Russia, the city hosting the 2014 Winter Olympics. A recent report looks at the threat climate change poses to Sochi and past Winter Olympic hosts. Toggle through all three to show the progression or just use one. On Friday, the Olympic torch will be lit in Sochi and the Winter Olympics will officially commence. 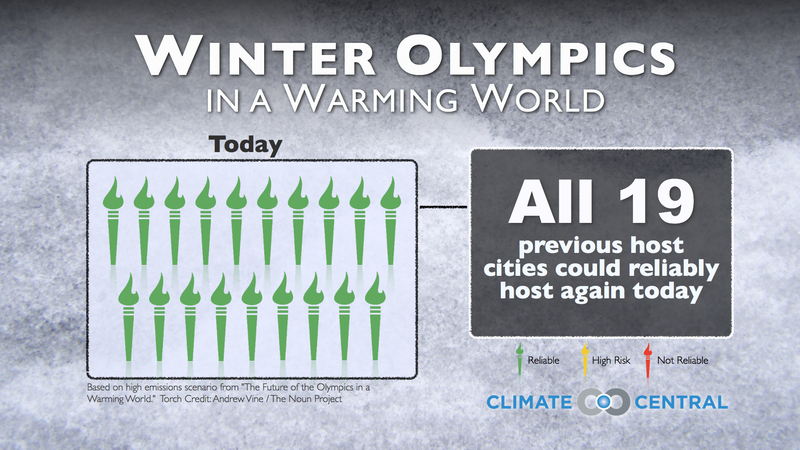 We thought we’d introduce you to the climate of the city that’s playing host to 2,500 Olympians as well as illustrate the threat climate change poses to Sochi and the 18 other past Winter Olympic venues. Sochi holds the distinction of being the first city with a subtropical climate to host the Winter Games. 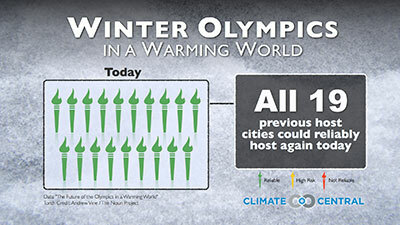 Its yearly climatology shares more in common with Summer Olympics host Atlanta than previous winter hosts such as Torino, Italy, or Lake Placid, N.Y. Sochi’s average high temperature during February is 50.1°F. The average low temperature doesn’t even crack freezing in February, bottoming out at 35.1°F. These numbers come with a caveat, though. While Sochi has some weather data available going back more than 100 years, better quality data is only available back to 1997. That means meteorologists for the Games have had their hands full getting a handle on the region’s weather. Russia’s meteorology service has a website devoted to Sochi so you (and the whole world for that matter) can monitor weather conditions and forecasts in real time. Sochi has one ingredient that makes it ideal for snow sports: mountains. Located in the southwest corner of Russia, Sochi is hemmed in by the Black Sea to the west and the Caucasus Mountains to the east. The highest point in the Caucasus Mountains, Mount Elbrus, reaches a height of 18,510 feet, but snow sports venues for the Games sit between 2,000-6,560 feet. Even at the lower and middle range of those heights, balmy weather is still a concern and Sochi organizers have installed more than 400 snow guns and stashed 16 million cubic feet of snow from last year to make sure races go off without a hitch. 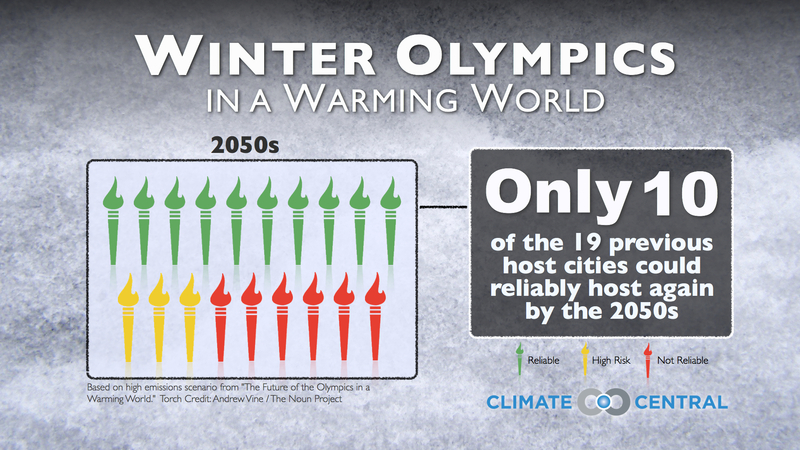 The likelihood that Sochi, and several other former host cities, could host future Winter Olympics is slim, according to future climate projections. 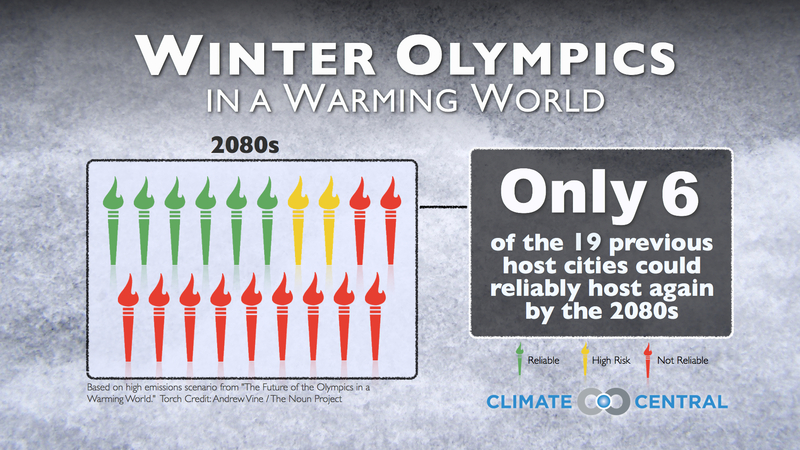 A recent report from researchers at the University of Waterloo looked at how past Winter Olympic destinations would fare in a warming world. They found that by the 2050s, Sochi and Vancouver wouldn’t be able to host an Olympics even if the rate of global carbon emissions slows. 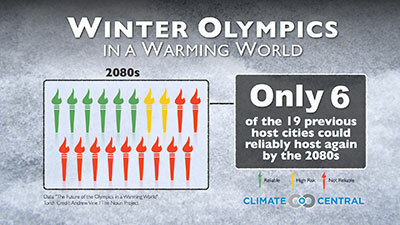 If carbon dioxide emissions continue unabated, only six former host cities would likely be able to host again by the 2080s. Under that scenario, temperatures at all 19 previous host cities would be, on average, 7.9°F warmer than they were compared between 1981-2010. In the U.S., Squaw Valley, Calif., would likely be unsuitable while Lake Placid, which has hosted the Games twice, would be marginal at best. Salt Lake City is the only U.S. location that would likely be cold enough and have enough reliable snowfall to be a repeat host if carbon dioxide emissions aren’t slowed.